The Middle East and North Africa (MENA) is one of the world’s driest regions, suffering from climate change effects. This calls for efforts to identify alternative and innovative solutions to mitigate and adapt to these changes. Water scarcity is a serious environmental problem in many parts of the MENA region, and will likely increase in the near future as a consequence of increased abstraction and climate change. Water scarcity exacerbates the effects of multiple stressors, and thus results in decreased water quality. It impacts river ecosystems, threatens the services they provide, and thus requires managers and policy-makers to change their current practices. There are, however, also other challenges not necessarily caused by climate change. For example, tackling inefficient water management remains a priority in the region. Numerous studies have been published on this subject to date. What research so far is lacking though is novel solutions to long-standing problems related to water management. 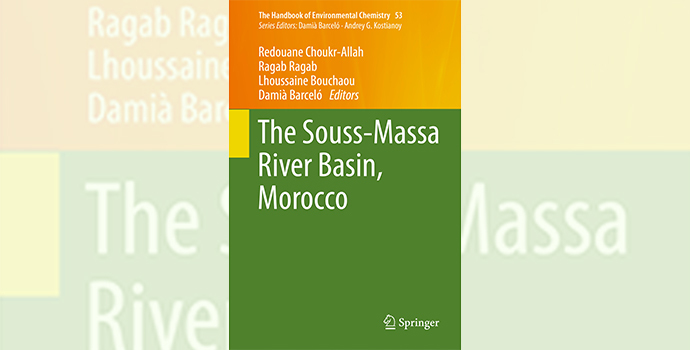 A new book called The Souss‐Massa River Basin, Morocco attempts to fill this gap and offer some novel approaches to dealing with these growing problems on the example of Morocco. Co-edited by Dr. Redouane Choukr‐Allah, Senior Fellow at the International Center for Biosaline Agriculture (ICBA), the book provides a comprehensive analysis of water resources in the Souss-Massa river basin in southwestern Morocco and lists novel water management approaches to narrowing the gap between water supply and demand. The book also evaluates conventional water resources − surface water and groundwater − and discusses in detail rainfall harvesting into dams along the Souss and Massa wadis. Moreover, the authors explore such topics as the geology of the aquifer; the risk of over-exploitation; alternative water resources such as desalinated seawater and treated domestic wastewater; as well as management approaches like Data Development Analysis and the SALTMED model, a tool for water, crop, fertilizer and field management. With a focus on linking scientific research with practical applications and the demands of agriculture and associated agro-industry, urbanization and tourism, which compete for limited water resources, the book appeals to environmental scientists, geologists, engineers and environmental managers. Other co-editors include Dr. Ragab Ragab (Principal Research Scientist and Water Specialist, Center of Ecology and Hydrology (CEH), Wallingford, UK); Professor Lhoussaine Bouchaou (Full Professor, Faculty of Sciences and Head of Laboratory of Applied Geology and Geo-Environment Laboratory, Faculty of Science, University Ibn Zohr – Agadir, Morocco); and Dr. Damià Barceló (Full Research Professor, Deputy of the Institute of Environmental Assessment and Water Research (IDAEA-CSIC), and Director of the Catalan Institute for Water Research (ICRA), Barcelona, Spain). The book is published by Springer and is available online at http://www.springer.com/us/book/9783319511290.